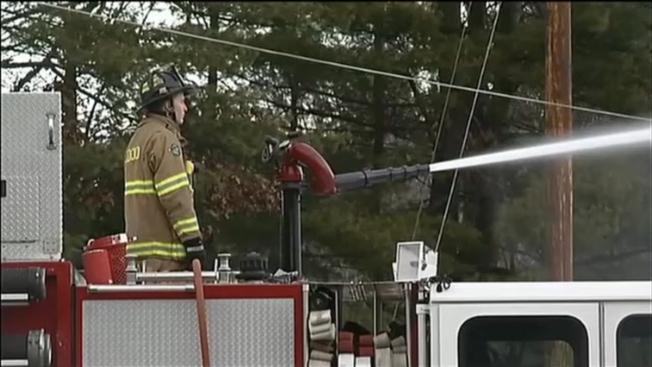 3-Alarm Fire Breaks Out in N.H.
Fire crews battled an out-of-control blaze Sunday afternoon in Goffstown, New Hampshire. The heavy 3-alarm fire broke out at 711 Mast Rd. The owner of a Chinese restaurant next door shot video. She said the North Garden Restaurant was packed for lunch when people started smelling smoke. "It was scary," said Winnie Zeng. One of the diners, a volunteer firefighter, called it in. A short time later, the abandoned building was a ball of flames. Manchester Fire was providing mutual aid. The industrial building was more than 100 years old, but it has been vacant for at least two years.